Add a touch of bling to your party wardrobe with the new collection by The Open Trunk. Choose from stone-studded stilettos, statement pieces, bracelets and potli bags. 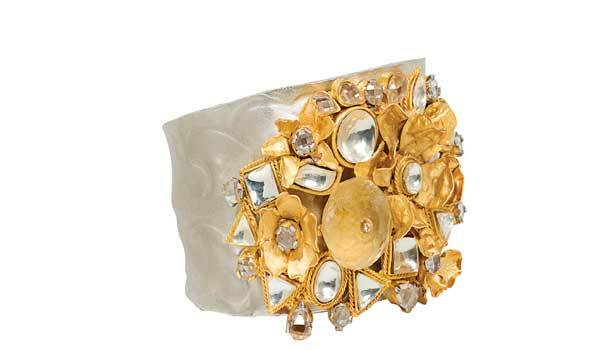 The textured silver handcuff, embellished with semi-precious stones in polki cuts, embedded in floral and leaf motifs is the star of the show. Rs 3,800 upwards. Details: theopentrunk.com. Be in vogue this winter season with the new collection from Shoppers Stop. The retail giant offers an interesting mix of printed jackets, elegant knit dresses, bright sweaters, cardigans in varying shades and more. Rs 1,199. At Garuda Mall. Details: 43401317. The Indian Crafts Bazaar exhibition brings the best of Indian textiles, artifacts, furniture, jewellery and more from different regions of India. From bandhej, Kota doria, Kutch embroidery to traditional Chanderi, thereai??i? ?s a lot to shop for. Rs 100 upwards. At Maratha Hostel Ground, Bull Temple Road. Details: 9535112332.